It may only be a supermini, but the current Renault Clio is big enough to accommodate a fully grown dinosaur. This becomes apparent after I climb aboard clutching a fistful of CDs and can’t find a slot in the glossy centre console. USB and jack sockets are standard across the range, but discs don’t even feature on the options list. So I drag my scaly hide back into the house and slide my CDs back onto their shelf, rather than into the bin where they apparently belong. 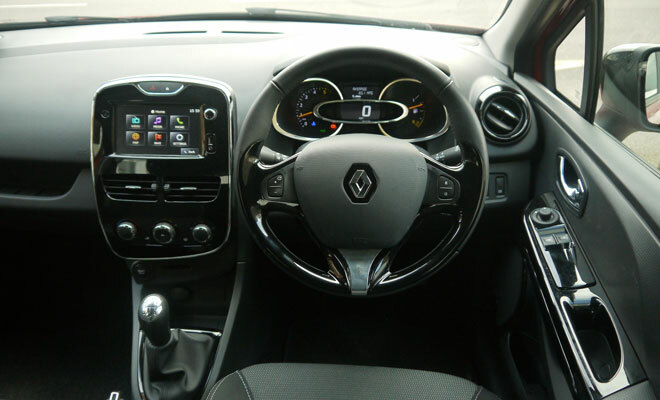 Fortunately I’m sampling a Dynamique MediaNav version of the Clio – one down from the top in a four-model range – so there is a Bluetooth option to stream tunes from my phone. If I’d ever got around to uploading any, that would be handy. Or I can scan the airwaves via the central seven-inch touchscreen. This is where the tech-fest ends, however, as the radio is strictly analogue. A digital receiver involves a £240 box that hasn’t been ticked. Sweeping out of East London on the M11, the sound quality from the standard speakers isn’t too bad at all. Choosing the £450 R-Link upgrade would have brought online connectivity plus a six-speaker set up, but even without that option you can choose how much louder you want the stereo to go with rising speed. Not that there’s a great deal of din to surmount. The engine note is surprisingly subdued, tyre roar is only an issue on those horrible concrete stretches, and a persistent rustle around the mirrors is chiefly noticeable because the rest of the car is so muted. Today’s Clio is an early 80s car – not a throwback to a bygone era, but a vehicle with a CO2 rating of just 83g/km. That is, almost, the best figure for any diesel car on sale today – to go much better you need a hybrid, preferably with a mains plug. Only the brand new Peugeot 308 BlueHDi beats the Clio dCi 90 Eco, and then only by 1g/km. The Pug is bigger, £3,500 more expensive than my £15,545 Renault, but a fair bit cleaner. It’s Euro 6 compliant, while the Clio has yet to step up from the Euro 5 level, meaning higher permitted output of nasty NOx and dirty soot. 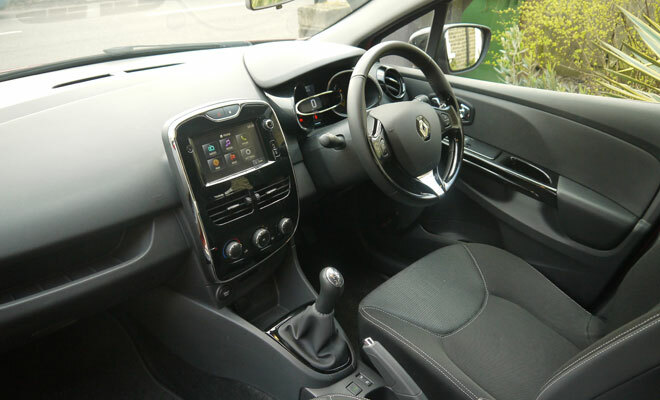 Still, the Renault is positively angelic on the wider scale, with fuel efficiency aided by stop-start engine tech and other bits of cleverness, such as energy regeneration while braking and an active shutter to control airflow through the engine bay. The ratios in the five-speed manual gearbox feel a little long, but not stupidly so, and there’s a prominent shift indicator among the instruments that prompts fuel-saving gear changes. It’s less of a dunce than some I’ve seen but still suggests gear switches you won’t want to make. Fortunately the box has a neat and tidy throw and there’s plenty of room for feet down among the pedals. There’s no denying the results. The official combined cycle score is 88.3mpg and while I’m not seeing that kind of figure I am cruising at normal three-lane speeds and getting 65mpg. 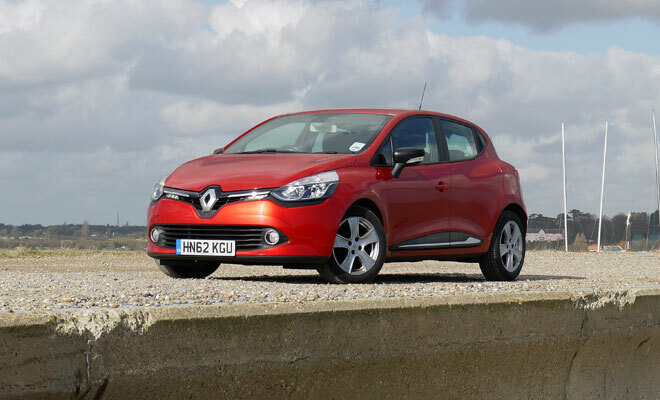 Given a 45-litre tank, that means the Clio is good for more than 575 miles between fill-ups. Plenty for today, at any rate. My destination lies 100 miles away on the Suffolk coast, and eventually the monotony of dual carriageways unwinds into interesting back-roads lined with unfolding spring greenery. 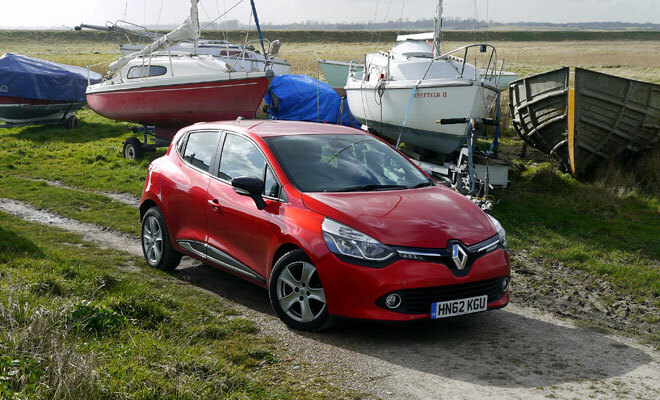 At a cruise the Clio can feel a little soft and floaty, and those flaccid feelings continue through tight country corners. 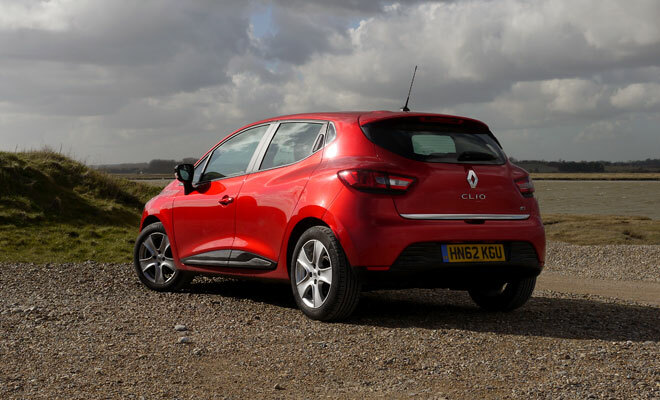 The rim of the Clio’s plastic and leather wheel may be as chunky as a cucumber, but its electrically assisted action is as limp as last week’s lettuce. Best to rein in speed and think about how much money can be saved by taking it easy. The MediaNav element of today’s Clio also seems determined to clamp down on speeding. With the otherwise excellent satnav running, I’m treated to an ear-jabbing shriek whenever I get within half a mile of a safety camera. Exceed the posted limit on your approach by even 1mph and the scream will batter your eardrums like some glass-shattering soprano until you slow down or, as I did, stop and work out how to shut it up. Setting off again, slotting into a gap in A-road traffic, I’m reminded that performance isn’t too bad for an eco-biased car. The 1.5-litre turbo diesel engine produces 90 horsepower and 220Nm of torque, yielding a 12-second sprint to 62mph and a reassuring feeling of eagerness from a standstill. Arriving, at length, at the coast, I park up and go in search of fish and chips. Carrying away the keyless ignition card in my pocket, the Clio obligingly squawks and locks itself as I move away. Returning, harassed by gulls with a taste for fried potatoes, I’m struck by what a good job chief designer Laurens van den Acker and his team did on the fourth-generation Clio, especially at treading the line between brawn and delicacy. It’s a pretty car, good from virtually every angle, with curvaceous surfaces that always seem to catch the light in interesting ways. Inside, the chrome-ringed instruments also always seem to catch the light but in rather less appealing fashion, directing burning beams at my retinas whenever the sun sits behind me. 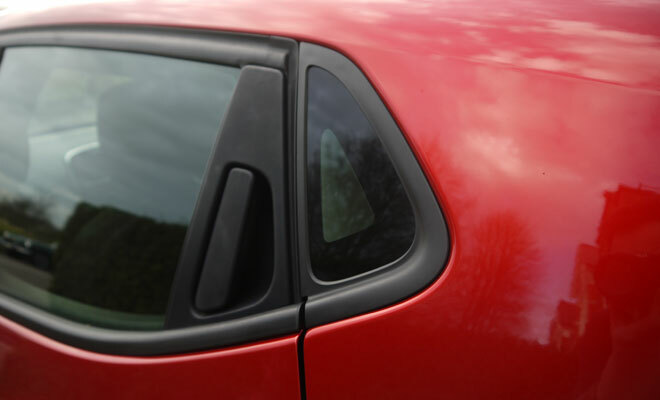 And over the shoulder visibility isn’t great when parking, not helped by what must surely be the smallest pane of glass fitted to any production vehicle, set into the rearmost pillar. Ahead, the screen pillars aren’t the slimmest, either, though their chunkiness no doubt contributes to the Clio’s five-star Euro NCAP rating. Bright LED running lights are standard across the range, and in my upper-spec car they automatically give way to dusk-sensing lamps as I put the sea at my back and turn towards home. 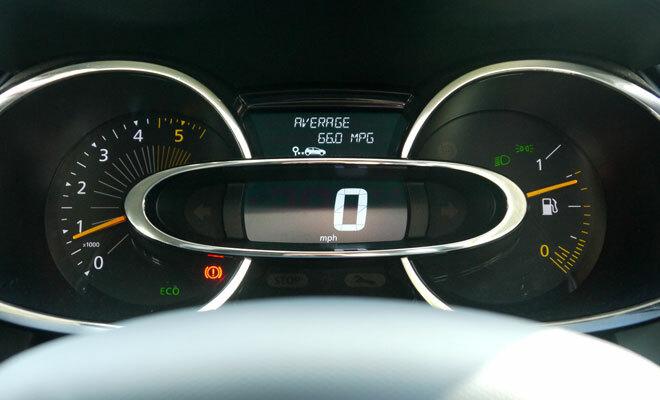 The trip meter has crept up to 66mpg. I decide that despite a few annoyances there remains a lot to like about this Renault. Even if does lack a CD player.